Health Links facilitate consumer review of literature given to patients by health providers. Consumers review patient information to ensure the content uses clear simple language, removes health jargon and promotes the use of colour, diagrams and photos where appropriate. Keeping information simple helps families understand health information and services needed to make appropriate health decisions for their wellbeing. “We used Waitakere Health Link to gain consumer feedback on our forms/letters to parents. The service they provided was very user friendly, quick and efficient. Communication was excellent as to where forms were at within the process. The feedback provided was extremely helpful, so good to get a totally different perspective to inform further development of our forms. Now we are aware of the service and it was such a quick and painless process I would most definitely recommend the use of Health Link to any peers or other services. “As the focus of healthcare is moving towards patient-centred care, it is essential that we include the expertise of consumers in our work. Waitakere Health Link helps us to produce patient information that is clear and concise, removing the medical jargon that we so easily overlook. 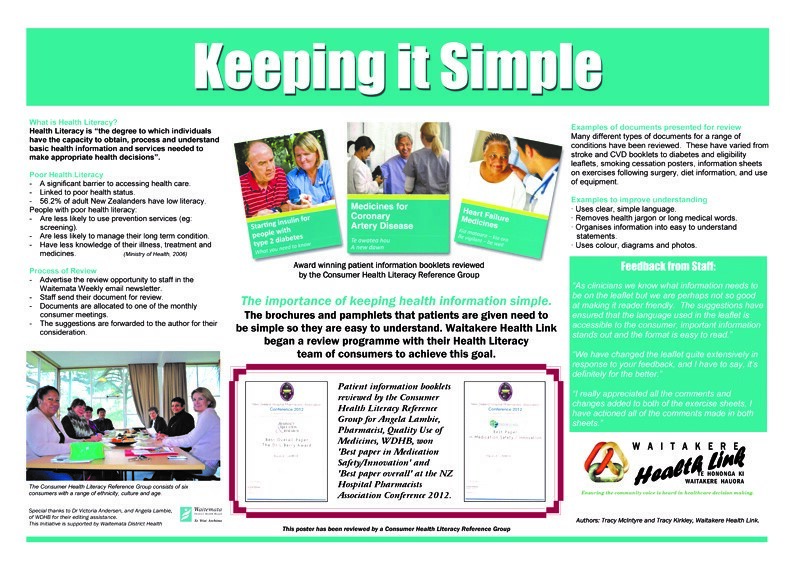 It is important that we continue to have open access to Waitakere Health Link so we can receive feedback from not just one person, but a panel of consumers who openly discuss each aspect of our patient information, from the text to the layout and images. It is important we get this right to make sure that we are providing our population with useful, and understandable information. “We find your service extremely valuable. It is great to have an insight into how our patients may interpret or visualise our information. I feel that in the context of language and what the lay person understands the service is very good. As health professionals we use words so often we can sometimes forget that the non-medical person may not understand and it helps to put into plain language. It was particularly helpful in regards to a family information sheet which was recently reviewed “what to expect when someone is dying”. “I found the service very user friendly, quick and efficient. Communication was very good as to where forms were at within the process and had an excellent face to face explanation of our forms”. “I highly value the opportunity to work with community conscious, caring individuals, who want to share their voices and work together to assist in providing information people can easily use. “I see Health Link as a vital link between the WDHB and consumers, giving us a voice and an opportunity to participate in an activity in which I feel that I can contribute. This work enables me to give something back to the community while allowing me an opportunity to learn what is available within the health services. Communication is vital if the health services are to be effective and Health Literacy, though we may think it simple, is surprisingly complex as each person uses language in their own individual way. “Given the difficulty of understanding medical terms and jargon. Health Literacy has helped to have a Pacific voice and input into information services within the DHBs. If you are interested in participating in the Consumer Health Literacy Reviews, contact us. Being able to follow a doctors instructions after a visit. Understanding how to take their medication properly. If someone can't understand the instructions, then they can't be expected to follow them. Its not just about intelligence or social class. Our health literacy skills depend on such factors as: education-ability to read and write, familiarity with the subject, language, culture, stress, boredom or lack of interest, age, sight and hearing. How can Health Providers make a difference? By ensuring that their communications with patients are clear and concise. By taking a patient focused approach. How can Waitakere Health Link help with health literacy? Ensuring that plain language is used in printed material given to patients. Develop collaborative initiatives between health providers to present information in ways that are easier to process and understand. Involve health service users with a range of literacy skills when producing patient information brochures. Health literacy isn't just about being able to read and write. Its about be able to receive information, to understand that information and being able to act on it.